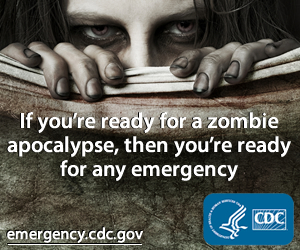 Even though Robert Kirkman's comic The Walking Dead takes place in a zombie-ridden world, the focus of the series has always been on human life. Nothing has changed for issue #100, which streets on July 11. 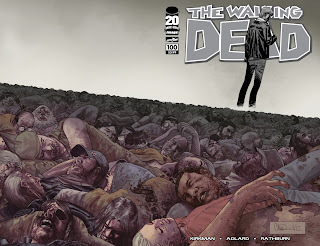 In the newly released cover (click for embiggened details), series artist Charlie Adlard depicts the corpse of every major character who has died during the comic's run since issue #1 in 2003. At the head of the pile of dead bodies is series stalwart Rick Grimes. Kirkman recently told USA Today he feels like he's only on issue ten, and that the milestone occurs "dead center" of his "craziest" story arc so far. Also, he says he still has a full tank of gas when it comes to The Walking Dead, so the book could continue for decades. One final thought: Based on his positioning at the top of the book by the title and above all the dead - more than a few he personally created - one wonders if Rick has witnessed and sacrificed too much that he has actually become "the walking dead" after all this time on the run. Deep, right?